I'm looking forward to my upcoming trip to California this May as I will be going to Yosemite for the first time in the Spring. 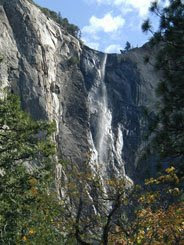 Springtime is the season at Yosemite where the waterfalls are gushing as they disperse the melting winter snows. There are several falls that can be accessed or viewed from Yosemite Valley, including Yosemite Falls which is the fifth highest in the world. The falls at Yosemite are known to be spectacular, so I can't wait to see them. I will have a new post, complete with pictures, after my visit in late May. I can't wait!